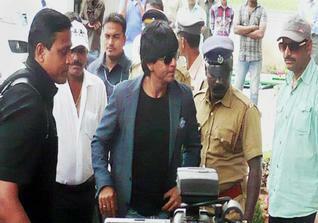 Sharukh Khan is currently in Munnar for the shooting of Chennai Express. It is for the third time that King Khan is in Kerala after making his presence before for the inauguration of Raviz Hotel and Emmanuel Silks. Sharukh who arrived in Munnar on Saturday will be in the town for 10 days while actor Deepika Padukone is also accompanying him. Bollywood superstar Sharukh Khan will be in Munnar, the beautiful hill station for 10 days for the shooting of 'Chennai Express'. The actor who arrived in Munnar on Saturday is accompanied by Deepika Padukone who is the heroine of the movie. King Khan who reached Nedumbassery airport at 11.30 a.m left to the shooting location after taking couple of hours rest. Devikulam lake, Meeshapulimala, Wagavara and Kannimala are the shooting locations for the movie. Even though a number of media persons were present at the Airport, Sharukh didn't speak to them or pose for photographs. Due to poor light, the shooting of the day was cancelled and it resume at Meesapulimada on Sunday. Sharukh is in Kerala for the third time after making his presence before for the inauguration of Raviz Hotel and Emmanuel Silks months ago. The crew of 'Chennai Express' is in Munnar for the shooting for the songs. The movie is directed by Rohit Shetty. Sharukh Khan would leave Kerala only on 21st April after the pack up of the song sequences. The naturalistic and exotic nature of Munnar has attracted Rohit Shetty to bring his crew to Munnar. Sharukh Khan earlier had come to Kerala for the shooting of 'Dil Se' with Preity Zinta in 1998. Tight security has been arranged by the police department as the actor is listed in the Z category for VIPs. Due to security reasons, the general public will not be allowed to visit the shooting locations. This romantic comedy tells the tale of a man's travel from Mumbai to Rameswaram and the exciting events to be followed in the journey are unveiled in the movie. The movie is produced by Gauri Khan under her production banner Red Chillies Entertainment. Being the co-owner of Kolkata Knight Riders, Sharukh Khan would miss the matches of his team which had won the previous season.